Maria Valente ’84 always thought she was destined to do something unconventional. But something in her fought that urge, and after she graduated from Iona with a major in English, she went on to law school. After successfully earning her law degree, she was offered positions at several prestigious firms. She turned down every offer. “That’s when I realized I had to do some soul searching,” she said. Maria’s mother and sister made chocolate in the kitchen, giving it away to family and friends. Later, Maria took up the hobby. But as she found herself unable to commit to a career in law, she realized making chocolate was more than a hobby. She finally surrendered to the call and enrolled in classes at the French Culinary Institute and in a 15-week entrepreneurial training course at the Women’s Enterprise Development Center. She also applied for and received a grant of $10,000 from Eileen Fisher for women in business. 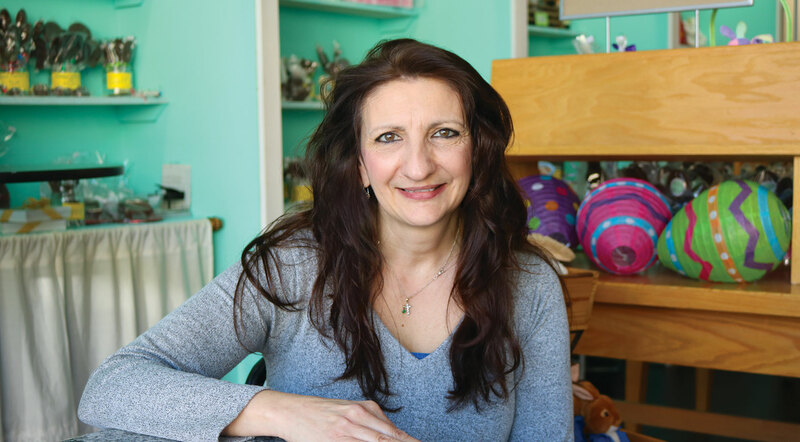 In 2006, she opened Chocolations in Mamaroneck, N.Y.
Maria is best known for her chocolate bark. Since then, Maria has moved into a larger space, expanding her offerings and allowing her to accommodate parties. 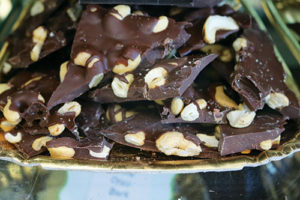 She is best known for her chocolate bark and also her truffles, which won Chocolations “Best of Westchester” in 2009. Ruby chocolate: A new chocolate made from the ruby cocoa bean will soon be available and will have a redder color and a fruitier taste. 100 pounds of chocolate are eaten in the U.S. every second. Chocolate is the only edible substance to melt at around 93° F, just below human body temperature. That’s why chocolate melts in your mouth.